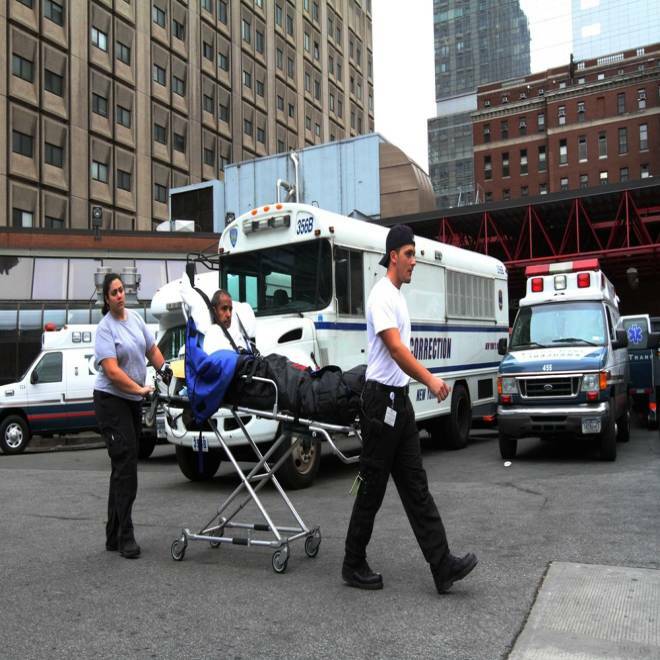 A patient is taken to a waiting medical transport vehicle outside Bellevue Hospital in New York on Wednesday. Bellevue Hospital, New York City’s flagship public hospital, started evacuating about 500 patients who had stuck it out during Sandy’s winds and flooding on Wednesday. The hospital has been on generator power since the storm knocked out power to much of the city of Monday, and it had already transferred patients on ventilators to other hospitals. The New York Times said people were carrying babies down staircases on Tuesday and described intermittent lights and a smell of fuel permeating the facility. Other hospitals were taking the patients from the hospital, on New York’s East Side. New York University’s Langone Medical Center had already distributed 300 of its patients to other hospitals amid the chaos caused by the storm.